The results Riverside rowers produced in the 1985 Head of the Charles Regatta confirmed the club’s transformation from a moribund neighborhood sculling club into an ambitious, growing organization dedicated to high quality rowing, both sculling and sweeps, at all levels of the sport. Having decided not to replace Northeastern University, which rented two-thirds of the boathouse, when the college moved into its own building, in 1983 President Jim Hanley, Will Melcher, Ted Van Dusen and likeminded members embarked on an ambitious program to attract enough rowers to Riverside to make it self-sustaining. Morning Practice Through Weeks Bridge. From left to right: John Marden (1985 Nationals Medalist), Vaclav Stejskal (former Czech National Team), Susan Gwen-Timothy (later on Canadian National team) and Maria Lane in the double, and Ted van Dusen. On the strength of Clark’s coaching and the arrival of rowers like Molly, 1985 proved to be Riversides’ breakthrough year. It medaled at the Bay State Games, its own Riverside Sprints and Cromwell Cup, and regional races from New England to Philadelphia, and finished third in the National Championships team points trophy behind Vesper and NYAC, with wins in the senior lightweight double (Ted Marks and Rick Gales), senior heavyweight double (John Marden and Bill Randall), intermediate lightweight single (Ted Marks), and placed a club member in the winning mixed double. Clark took a large contingent to the Canadian Henley Regatta, where Riversidewon nine women’s events, including six junior sculling titles. Each women sculler placed in the top three in her event. Among them, Carey Beth (C. B.) Sands, a future United States Rowing Hall of Fame member, won the junior and senior lightweight women’s single; she and Ruth Kennedy won in the junior and senior lightweight double and quad; while Izzie Gordon, Deb Fine, Maria Lane, and Mary Anczarski placed second in the quad. On the men’s side, Dan Chernoff and Jeff Parks won not only the junior but the senior lightweight double event. With these results, the club began its history of continuous success in Canada. 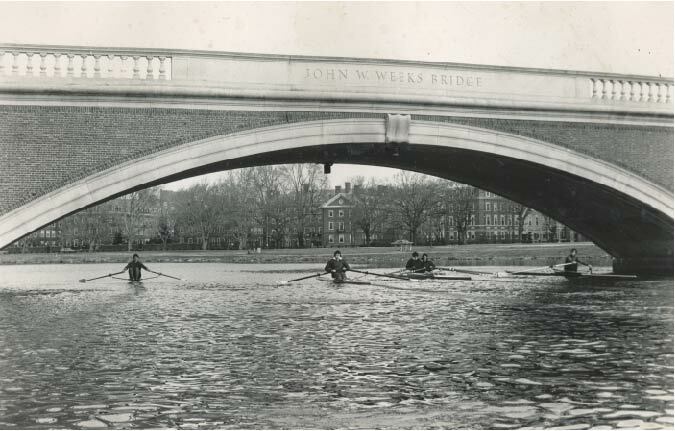 Riverside’s re-emergence as a rowing force culminated in the Head of the Charles that fall. Although regatta records do not identify the 1985 points winner, Clark clearly remembers Harvard coach Harry Parker pulling alongside the dock to congratulate him and the club on winning the trophy, the first club ever to do so. Riverside rowers having internalized the mindset espoused by Clark that they would dominate the river, they confirmed the club’s ascendancy in 1986. Led by Sands’ first place in the lightweight women’s single, it finished second in the points trophy behind Harvard and ahead of Yale. Four Riverside rowers placed in top three, including Maria Lane’s third in the women’s club single event.